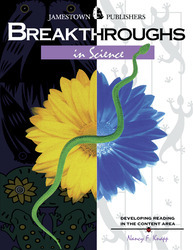 The Breakthroughs series improves students' content area reading skills while building valuable problem solving proficiency. Breakthroughs in Science helps students practice increasing their comprehension basics, understanding illustrations, analyzing ideas, building vocabulary, and evaluating ideas commonly found in science materials. Content–area readings. Enhances and strengthen students’ content–area reading skills. Pre-and post-tests. Multiple–choice format identifies students’ strong and weak areas. Comprehensive chapters. Builds vocabulary, thinking, and study skills, and content–area reading requirements. Special exercises. Encourages higher–order thinking skills–analysis, evaluation, synthesis, and application.